I didn't put his first wife down , no one said he didn't love her the bottom line is he was not ready and it didn't work. They couldn't make it work. I don't think anyone is putting Talia down at all. But it was a very different time in George's life. And from what I have read about their relationship that he has been willing to discuss he blames himself for not making it work. This is just my opinion but from what I read I don't think George was committed to that relationship in any way that comes close to his commitment to his marriage to Amal. Well ,you don't but i do! George's relationship to Kimberly Russell was finished 17 years ago, and his marriage with Talia had ended before. So do we really discuss now these relationships in comparison to his marriage with Amal? People evolve, mature and change their minds. I saw a few interviews where George talks about his failed marriage and took the blame for its fail. I guess most people don't get married to say: "Well, if it doesn't work we can always divorce in a year." Especially when you're educated in a strict catholic family it may not be the easiest thing to admit that you failed. True I think his up bringing and desire to make it work helped them to stay together much longer . Unlike, today's 72 day marriages . starlove wrote: p.s when someone feel pushed in marriage or it was mistake he divorce in less than six months not 4 years like Kim K and many other Celebs and normal people. Marriage wasn't long but their relationship was .how long they dated/loved each other before getting married was longer,he said they were together then broke up for a while and Talia dated someone else then they are together again and he asked to marry her and went to LV. am not making up facts it's an interview with George somewhere! And George was with Kelly and then got back with Talia. What's your point Starlove? We know this already. Many people breakup and try to go back it will not last which it did not in George's case the reason you broke up doesn't magically disappear because you give it another try. If you are not meant to be together and aren't ready for marriage which in my opinion George was not it will not work . He tried but in the end it had to end. Thank you, DoubleZoe - and wow! Is anyone able to post the article for DoubleZoe's link? When I click on the link, it takes me to the express and there is no article. The article is gone . Pan what did he say your wow has me curious. And that's what happens when you don't post the articles! Can someone in the uk post the article? Link doesn't work in my country. melbert wrote: And George was with Kelly and then got back with Talia. What's your point Starlove? We know this already. My point is not giving up my mind and my point is not looking at ex wife of someone as just unimportant fling/relationship ,just because she is his ex wife , i already know that .talking about all girls and ex wife of George as very stupid non important is actually stupid and low class if that talk from George or anyone else! George can speak about his love all the time he wants to but no man in history speak about his wedding and love only when the alarm of promoting his films rings after two years or even more if you count the time before the engagement ,that's eye rolling and not romantic at all !! GEORGE Clooney has opened up about the moment he proposed to his wife Amal. The film star revealed that the idea of marriage hadn't entered his mind until he met Amal at a charity fundraising event in 2013. Speaking exclusively to OK! magazine, George revealed how marriage has changed his life. "Getting married had never been been on my agenda," the 54 year old admitted. 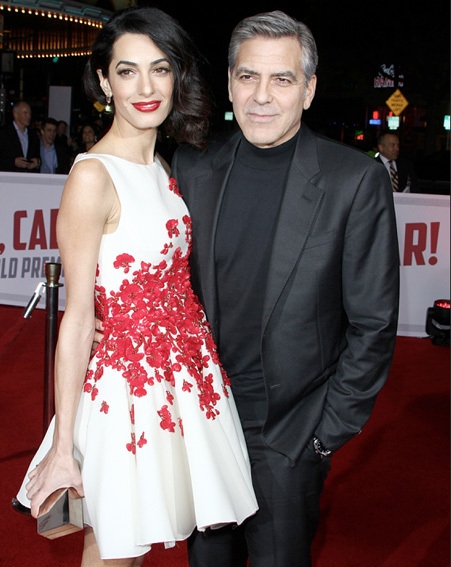 Related article: Amal Clooney takes the spotlight alongside George at LA premiere of his film Hail, Caesar! "But then I met Amal and I knew that this was the woman I wanted to spend the rest of my life with. There was no doubt. I just hoped that she felt the same way about me." The couple, who got engaged after 1 year of dating, were officially married in September 2014 in Venice. 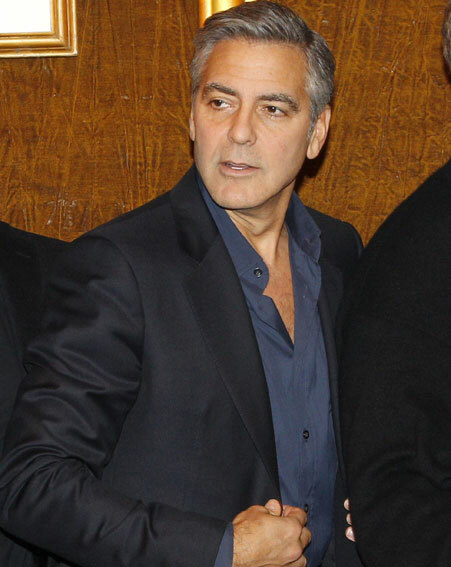 George admits that he never had marriage on his mind, however, saying the couple had never discussed the idea. "Honestly, we never talked about marriage. But then I simply asked her. That was one of those moments where you don't know what's going to happen. "Maybe she's going to say: 'Are you crazy? I thought we just wanted to have fun with each other, and now you're suddenly serious.'" Opening up about life after the pair got married, the actor didn't hold back when it comes to expressing the love he has for his wife. "I've never been happier. Both professionally and personally. From the first day I met Amal, I began preparing for the most important phase in my life. "For me there is no greater joy in the world than the idea that we're going to stay together forever. Never did I ever dream that I would have such a beautiful, successful and fulfilling life and also be able to find a woman as wonderful as Amal." This is taken from an article in the middle east Hello . He talks about marriage making Hail Ceasar and strong women. (b) isn't 'OK!' magazine one of the worst 'George is divorcing/Amal is pregnant' offenders? Why would he grant them an "exclusive interview?" Yep. Many of George's quotes came from the Hello article and Ok! pieced his quotes together to enhance their article. But the sentiment is basically the same. So true, Donnamarie. OK does not have the length and breadth of stories or exclusives, but seems to borrow and edit others presumably to reduce budgets. "The couple, who got engaged after 1 year of dating, were officially married in September 2014 in Venice." That kind of ruins HIS timeline of when they met, eh? O.k borrowed this info and put the wrong engagement info and didn't bother too check it. annemarie wrote: O.k borrowed this info and put the wrong engagement info and didn't bother too check it. Exactly. The quote from the article is Ok's assertion. Not George's. As we discussed earlier this article seems to be a piecemeal of George quotes and Ok! info they probably gathered from past news stories. 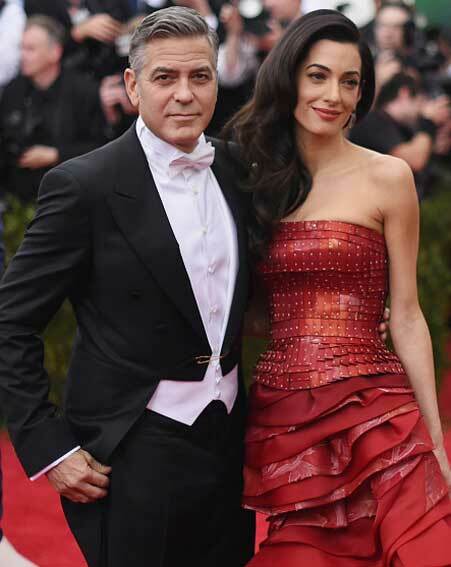 I don't think George has ever been quoted as saying he met Amal at a charity event. Has anyone here ever seen that quote from him? Or heard him say it? I could be wrong. As far as I know he has said that they met in Como through a friend of a friend. But Ok is claiming, which other news stories have in the past that they met at a charity event.